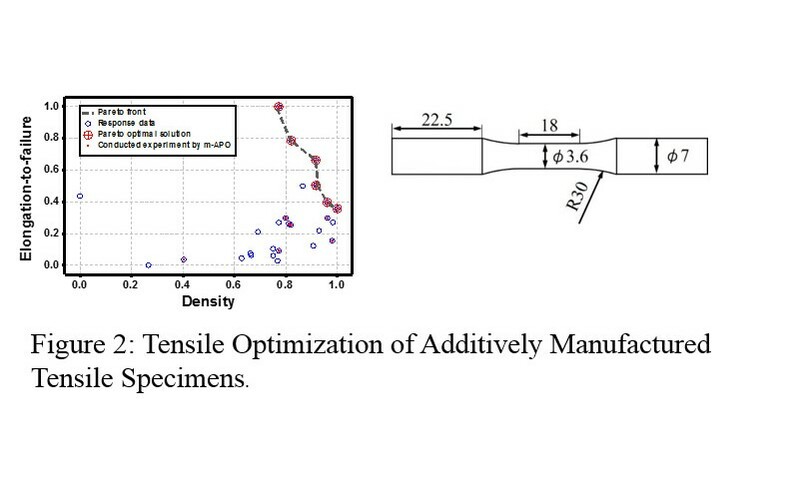 Identifying the process parameters that result in targeted mechanical properties is a challenging problem because of (1) the large number of process parameters involved (e.g., the SLM system has over 70 adjustable process/design parameters), (2) unknown functional relationship between part properties (e.g., porosity and mechanical properties) and process parameters; and (3) unknown optimal values of part properties. To address these issues, our team has developed an Accelerated Optimization Scheme that can “smartly” guide the selection of optimal process parameters by mining and leveraging existing data. A host of experimentation data pertaining to various types of LBAM machine and material systems has been published by various research groups. However, due to different experimental conditions (e.g., original equipment manufacturer, powder vendors, operation environments), the results from different sources can be significantly different. This work has leveraged the available experimental data, readily available in the public domain, to smartly identify and characterize the similarities among experimentation data from various sources. 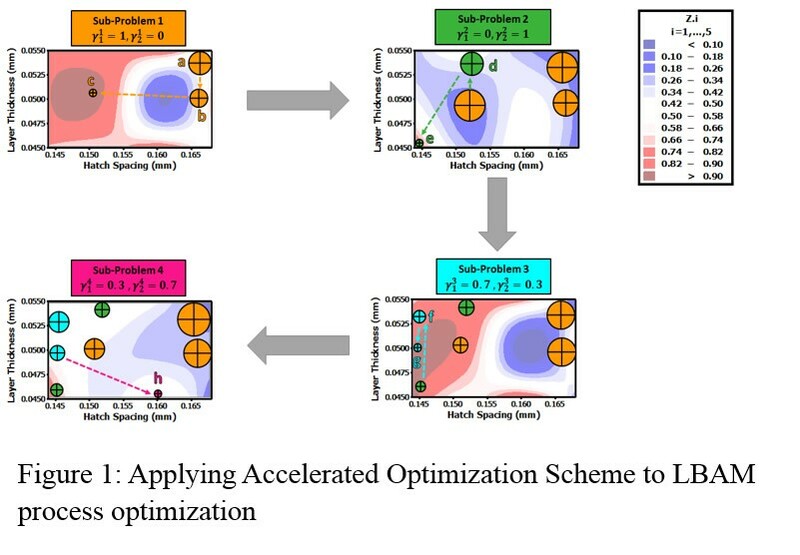 This novel approach creates a material-dependent experimentation scheme that can achieve optimal process parameters with significantly fewer experimental runs and accelerate the certification of AM products. This new methodology has been published in IISE Transactions (Aboutaleb et al., 2016) and was selected as a finalist for the 2016 INFORMS Best Paper Award in the Quality Statistics and Reliability cluster. The variability and uncertainty associated with the underlying thermo-physical transitions during the fabrication leads to inadvertent and inevitable microstructure anomalies (e.g., defects and porosity). As a result, even parts fabricated using optimized process parameters may lack satisfactory quality to meet the stringent requirements of industrial applications in biomedical, automotive, aerospace, and more. 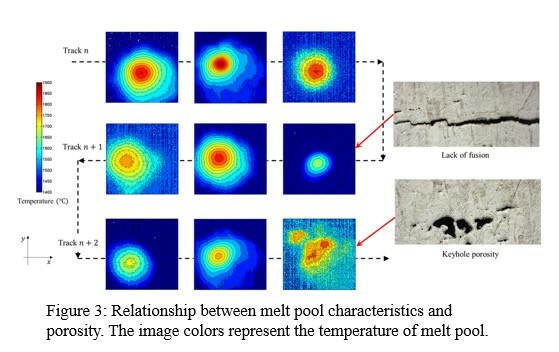 The characteristics of melt pool behaviors during AM fabrication tend to be correlated to the microstructure anomalies and defects (see Figure 3). 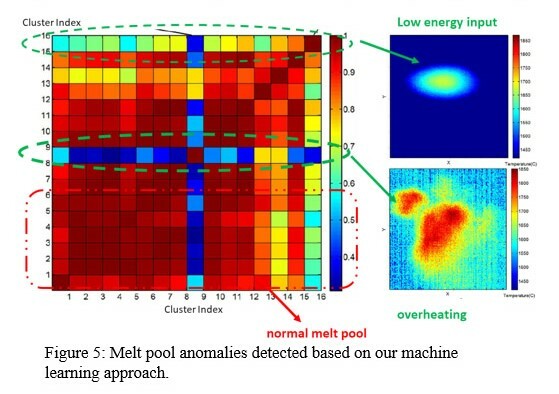 Our team has developed new features of the thermal history using physics-based, data-driven methods as illustrated in Figure 4. We have created new advanced data mining methodologies (e.g., clustering, classification), customized for thermal image processing, to extract the features of the thermal imaging data streams. 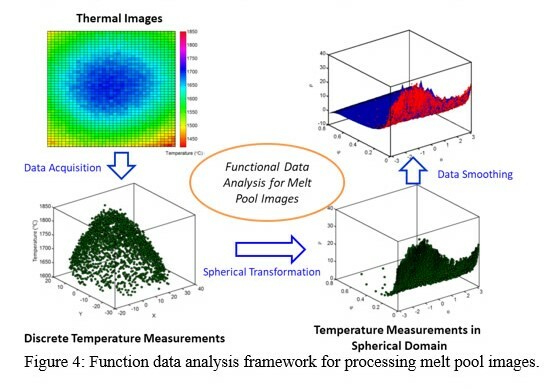 The developed methodology converts high-dimensional, ill-structured melt pool signals to continuous functions with identical support. A proof-of-concept study (Khanzadeh et al., 2016) shows that our methodology can accurately predict the formation of pores in a Ti-6Al-4V thin wall build as shown in Figure 5. This work is leading to the development of a theoretical foundation for more accurate online process control, layer-wise certification and non-destructive evaluation of parts. Ultimately, the developed new process signatures, coupled with the proposed accelerated optimization scheme, will allow for better design and control of process parameters during the build.